In this class, students will improve their needleturn appliqué skills while making a lovely pillow to bring the garden inside their home. In the first workshop, students will hone their needleturn appliqué skills while learning Deborah’s simple techniques to appliqué stems, leaves, petals, and ovals. 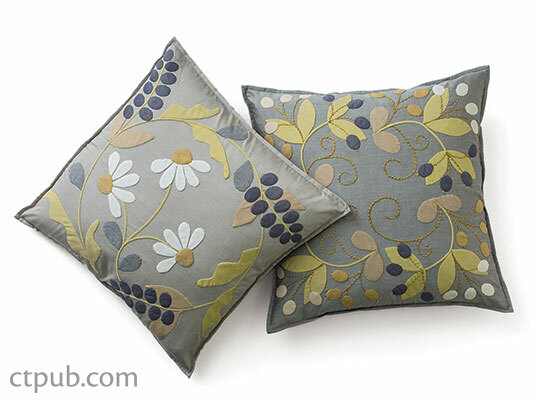 In the second workshop, students will learn how to transform their completed appliqué panel into a gorgeous pillow. The pillows are pictured on pp. 17 and 21 of Floral Abundance Quilt. The class level is easy to intermediate. Two classes of 3 hours each, approximately one month apart, so that the appliqué can be completed in time to construct the pillow in class two. For class one, each student will need some table space and access to a pressing station. There should be one iron and ironing board for every four people. A classroom with nice big windows makes for an easy way to trace a long design, using windows in lieu of light boxes. Simply stick the pattern on the window and trace. For class two, each student will need table space for their sewing machine and access to a plug socket. Details for appliqué of flowers and stems and embroidery stitches can found in Part 1: The Basics (pp. 6-7). Pillow details can be found on pp. 21–22. Follow instructions 4-7 on p. 22 to make pillow. Enjoy!